Looking for casual Valentine decor inspiration, look no further than your local Target. They have everything you need to create an easy, cozy, and romantic table for you and your sweetheart.I was perusing the aisles of Target this week looking for fun cards for my son to exchange in class on Valentine’s Day….three weeks in advance, that’s a record for me friends! Typically I shop for class cards on February 13 and end up buying the sad leftovers no-one else wanted. What makes this shopping experience difficult, is that the kids can’t exchange candy with the cards…crazy right..no candy for V day! I ended up buying sticker emoji’s which my son loved. The cards are purchased and my son prepared them the same night….I’m feeling like mom of the year! Woo hoo! What’s next? Easter…here I come! Alright…mom slow down, we still need to get through February 🙂 Ok..as I was saying, I found my inspiration this year at Targeé. I wanted to create a dessert table setting, so I picked up these casual pink bowls for $1.99 a piece HERE. They are heavier than you would think for that price, and hold up to 27 ounces. They are a pretty compliment to my graphite dinner plates. This pretty cake stand with ribbon is from Home Goods HERE, purchased last year. No Valentine table is complete without fresh blooms. These pink roses immediately caught my eye at Target and are opening up beautifully. Adding soft pillows to the chairs creates a romantic and inviting setting. These pillows were purchased at Home Goods. Strawberry and Cream Trifle is a perfect Valentine’s day treat, super yummy and easy to make – upcoming recipe this week – stay tuned for the next post. 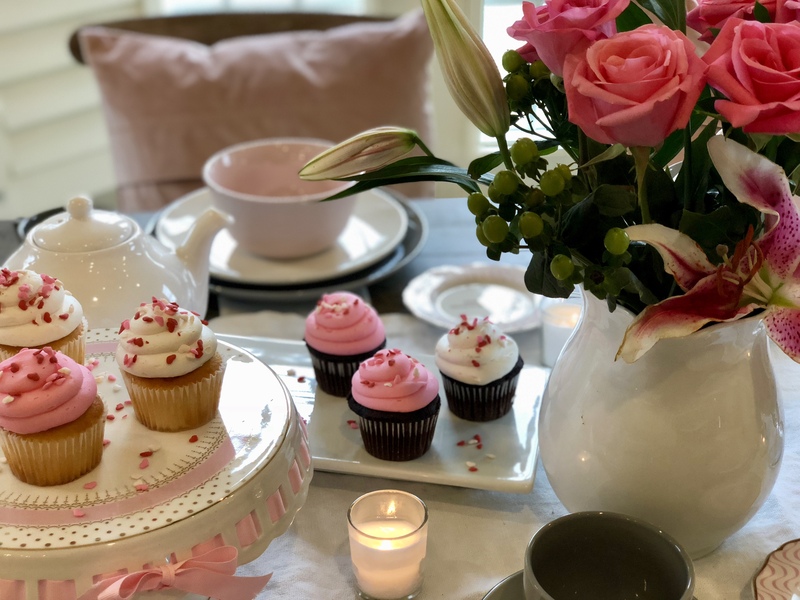 Cupcakes and tea are a must to our Dessert table. A Belgium linen table runner completes the look, leaving the place settings resting on the natural wood table. There you have an easy, charming, casual, and rustic romantic table for all the sweethearts in your life. Happy Valentine’s Day to all of you and the ones you LOVE. Thank you Lynn, so sweet of you. It was so easy to do with just a few accessories, appreciate you stopping by! I love the colors, pastel with a mix of vibrant natural feel, I can’t believe Valentines day is almost here. wow. Thanks Sammy! Really fun to put together and very easy. Hi, welcome! I will definitely check out your blog! It looks lovely! The cake stand with the pink ribbon is adorable. Thank you! Cheers to Home Goods!